Veterans for Peace held their sixth annual Peace Poetry contest reading/reception on May 9. There were 225 poems submitted from all K–12 schools in Alachua County, and 34 winners were chosen. The students read their poems in front of 150 guests and received a gift certificate to a local bookstore and a book, which included all of the winning poems. 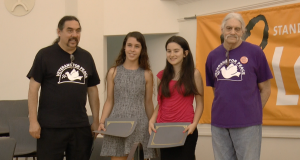 This year Veterans for Peace also awarded three $500 scholarships to 3 students — Manuela Osorio (pictured), Catalina Cardenas (pictured), and Michelle Nelson —entering or attending college who have demonstrated leadership in peace and social justice causes. Musicians Lauren Ann Robinson and Bill Hutchinson performed at the event. Photos by Deborah Hendrix.